Apple recently announced updates to the core software on all of their hardware platforms with various interesting new features. One feature that jumped out when looking through it all was support for displaying web content in watchOS 5, it’s important to clarify that they haven’t added a standalone Safari app to watchOS but instead it enables any links sent via Mail or Messages to be accessed and then displayed right on the watch. 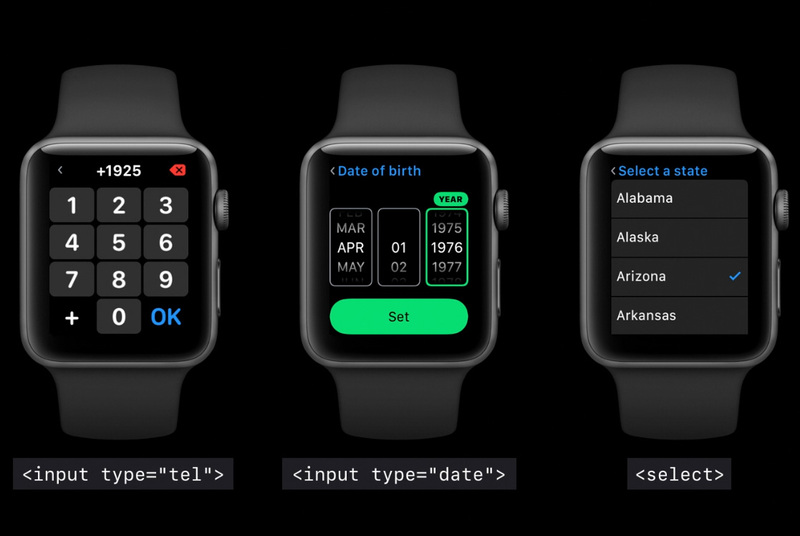 To get a quick overview it is worth taking a few minutes to watch the “Designing Web Content for watchOS” video on the WWDC2018 videos site as it gives a good overview. Back/Forward navigation is controlled either via an overlay UI brought up via a firm press on the screen or by swiping back and forward from the edges of the screen. If the web content being accessed is responsive then it treats the content as being 320px wide, the same width as if on an iPhone SE (iPhone 5 or older width). So text may be smaller but at least it will basically render the smallest breakpoint content, so it doesn’t require any new even smaller breakpoint to be catered for. This is done by overriding the “initial-scale” value and provides a viewport with the dimensions 320px by 357px and reports a media query size of 320px. So existing responsive content will render on the Apple Watch without requiring any changes – at least from a layout perspective, worth noting the lack of support for Web fonts as this will likely have some rendering impact as it falls back to alternative fonts in the font stack do display. Even though responsive content will be rendered quite well by default it is possible to optimise content for display on Apple Watch. The above image shows the standard responsive content being displayed on the Apple Watch, basically just the same as it would be on an iPhone SE (minus any web fonts of course!). Using a media query it is possible to modify this layout to display as a single column. There is an example given in the video which obviously won’t apply for all uses, but basically it uses “min-width: 320px” as the baseline for showing the content as two columns, so any content below that would render as a single column. Again, how this works specifically for your layouts will vary, but there will be some methods to use for frameworks like Foundation or Bootstrap etc. 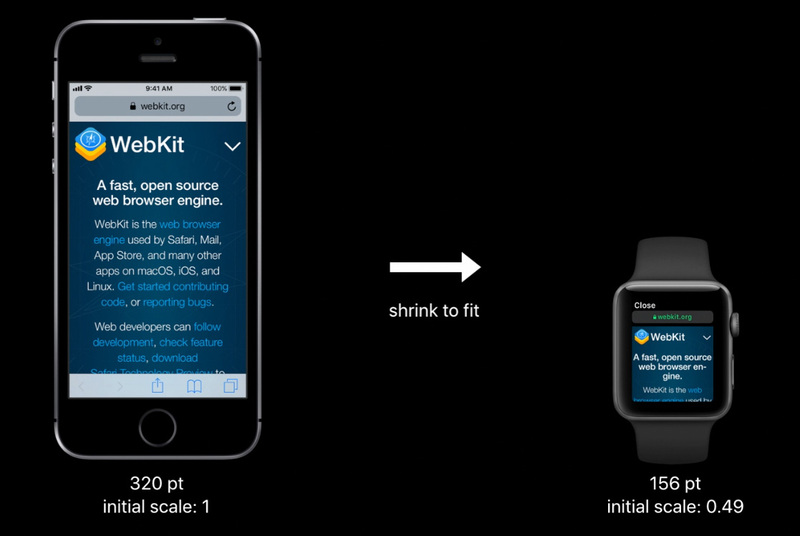 With this meta tag in place the device width will be treated as the real width of Apple Watch’s screen. This again has similarities to how content was handled when the iPhone originally came out, existing content is displayed as best as possible but there are ways to optimise for the device if you want to. Making use of HTML5 form control types is really important on watchOS, setting the type attribute to “email”, “tel” etc will bring up a specific, full screen UI to allow interaction. Additionally making use of labels, placeholder or aria-label attributes enhance the context given when interacting with these controls. Hopefully you’re using these already but here’s another reason to do so. This is a feature found on iOS and macOS which basically formats pages to show a more readable version of web page content. It’s a little unclear from the video but it sounds like pages that are “text heavy” will get displayed using Reader, although I’m not 100% sure how that would be determined exactly if so. Perhaps this is a way to handle big pages that might have a lot of adverts on it? Reader view is an option that users can choose by firmly pressing on any page to bring up the navigation overlay, so even if content is displayed normally a more readable version can be accessed. 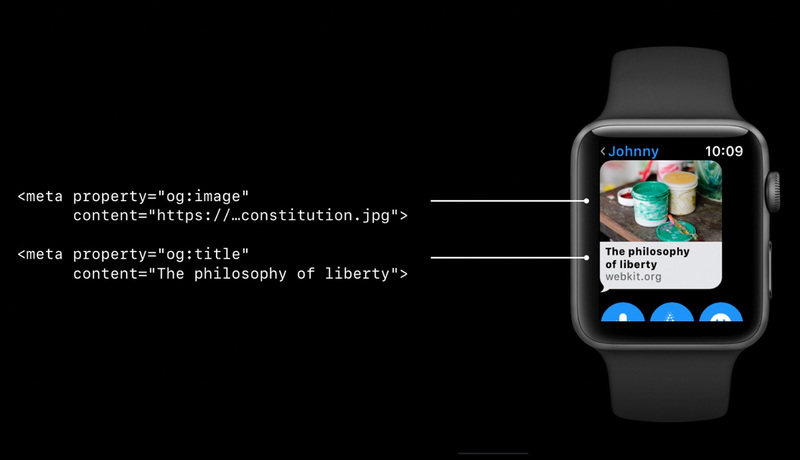 Reader view makes good use of semantic markup, using the “article” tag helps the display of content, and attributes like “item-prop” and other semantic tags like “strong”, “em”, “blockquote” etc enhances the display of content in Reader on watchOS. Using Open Graph meta tags is something that makes sharing content around the web such as into Facebook, Twitter etc look better by providing specific preview content such as images, titles etc. watchOS makes use of these Open Graph meta tags to make the previews for any shared links look as good as possible. That’s a quick overview of some aspects of watchOS 5’s support for web content, there’s definitely a few things to consider in there but if you’re building pages using responsive layouts and using semantic HTML then things should work fairly well without having to do anything. The biggest issue I see initially is the lack of support for web fonts, that seems like it could cause some display issues due to the fallback to alternative fonts in the stack or if web fonts have been used for icons etc. 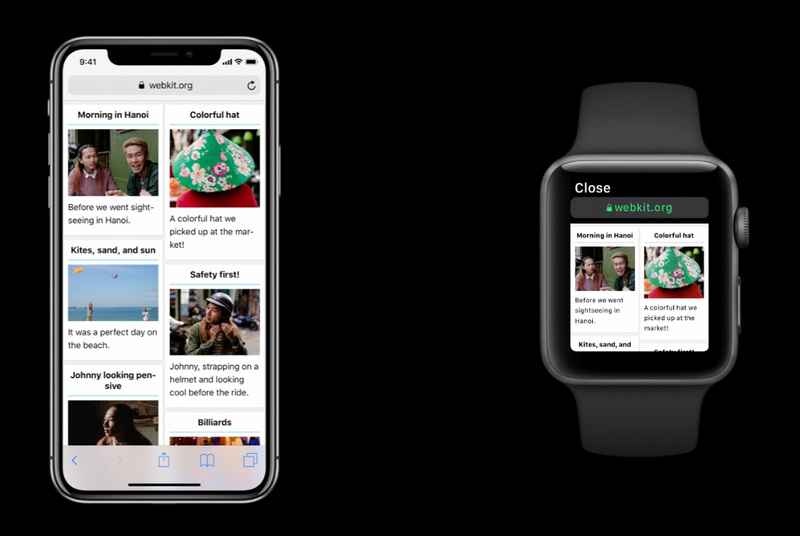 I’m also interested to know what the impact on battery life on the watch is like when loading and rendering multi-megabyte web pages which are not uncommon these days, I think Reader view is going to be an essential feature for viewing web content on Apple Watch. Like many web design / developers I’ve made use of virtualisation applications like VirtualBox, Parallels Desktop and VMWare Fusion for Mac in order to test websites in the various versions of Internet Explorer. Using these apps requires buying the relevant Windows licences for the various virtual machines and also the overhead of keeping these current with the latest OS updates and browser / plugin updates too. However, I recently did a fresh install of OSX on my Mac and decided just to remove all of the virtual machines due to the amount of space they used and had every intention of installing them all fresh and continuing to work that way. But due to project demands at work I had no time to do it and decided to look around for alternative ways to do some testing as I needed to do it for a project. I had previously used Adobe’s BrowserLab tool for quick static testing for layout issues in browsers but I needed something that let me browse sites and actually interact with the pages, and that’s where BrowserStack fits the bill perfectly. The connection is then made to the virtual machine and rendered via the Flash plugin in your browser allowing you to interact with the site remotely, you can then easily choose from different OS and / or browser versions and then hit the "Update" button in the left hand menu and it will automatically grab the current url you are browsing and open that using your desired selection. Overall it’s just a really easy to use system and lets you switch between different OS / browser variations much more quickly and with much less system overhead than using locally installed virtual machines. You can run any OS you want on there including Win XP, Win 7, Win 8, OSX 10.6 Snow Leopard, OSX 10.7 Lion, OSX 10.8 Mountain Lion as well as mobile tablet OS / Browsers iOS, Android and Opera. 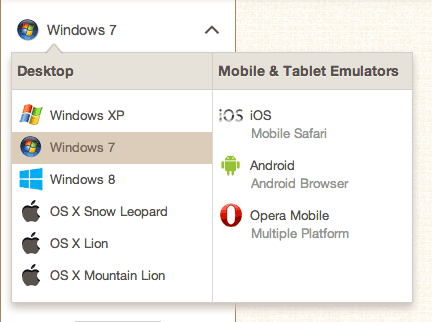 Quick to load up OS / Browser options. Low overhead on your computer compared to running one or more VMs natively. 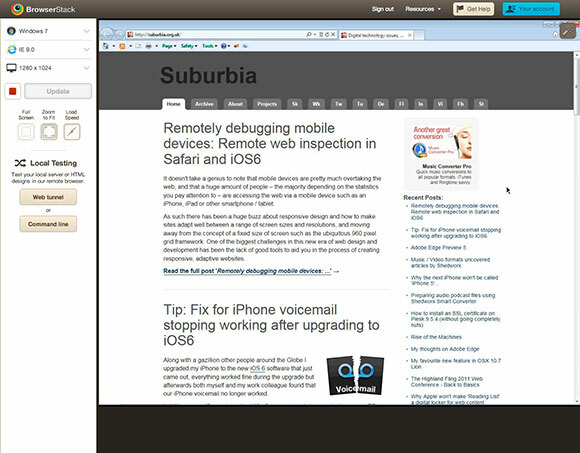 Developer tools such as FireBug installed on all browsers. No new OS licences to purchase. No OS updates or browser update hassles. No Linux OS / Browser options. 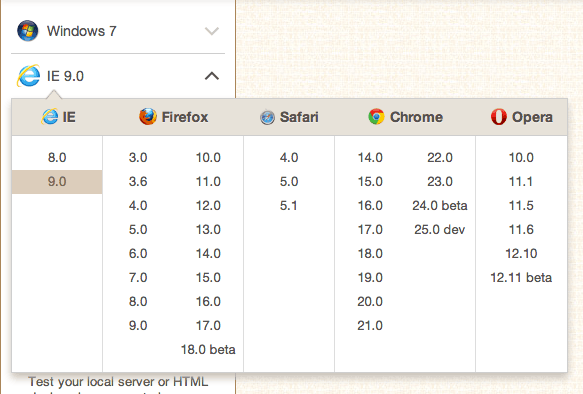 You only get one browser option at a time, so if you’re using Win 7 with IE9 and want to test Firefox you need to select Firefox from the browser list and hit "Update" to initialise a fresh connection with only that browser. Slow refresh rate for moving / animated content so it’s not great if you want to preview how well videos or animations run on your desired test platform. This is probably the biggest reason you may wish to test on local VMs instead. So, that’s a basic overview of BrowserStack, but the best thing to do of course is try it yourself using the free trial which gives you 30 minutes (non-consecutive) to try out the full system.